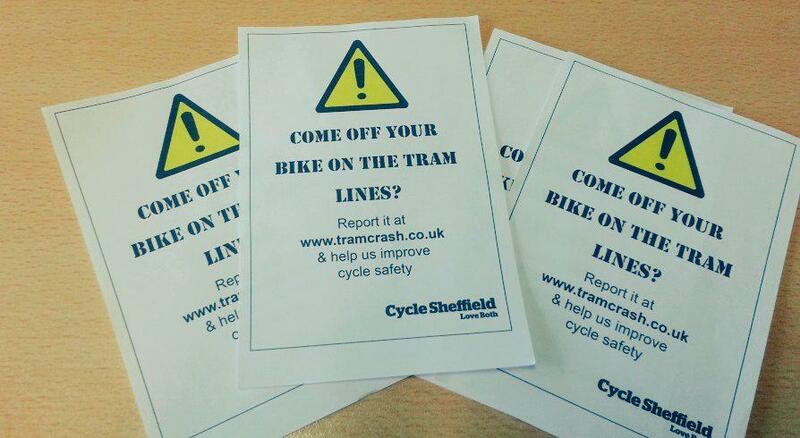 Cycling and the Sheffield Tram Network – A match made in hell! 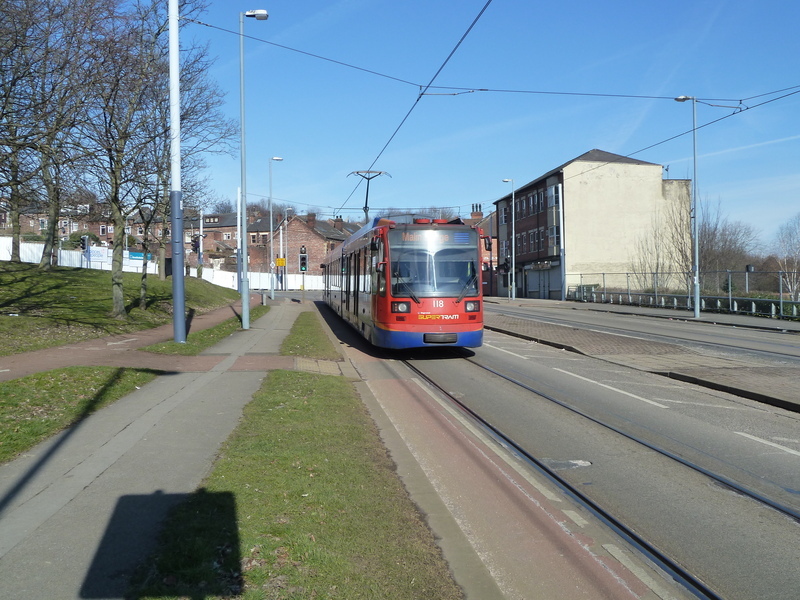 We have a tram network in Sheffield known as the Supertram, it opened in 1994 and has 35km of track with about 50% of this on normal streets shared with normal vehicles. If there’s one thing to know about riding a bike on tram lines, it’s that you must NEVER get your wheel stuck in the tram line, you are very very likely to be thrown off. It has been estimated that there are a minimum of 33 accidents per annum where cyclists have difficulties with tram tracks, and over 50% are serious in nature (An Investigation Into Cyclist Safety on the Supertram Network In Sheffield, South Yorkshire, Sheffield City Council, December 1998). These figures were calculated using data from 1994 to 1998, the numbers of people cycling has more than doubled since then so the number of accidents may have increased. A width of 1.1m is within DETR guidelines for advisory cycle lanes and similar widths have been used successfully in the past. It is acceptable then as a reasonable width for cyclists to have to use. It is well known that this area on a carriageway nearest to the kerb,is less than ideal as the preferred position for riding a bicycle. Cyclists are required to navigate through litter, everyday road detritus, uneven surfaces due to badly levelled or positioned gullies, badly applied zig-zag and yellow lines and potholes, whilst also avoiding the hazards of left turning and parking vehicles and car doors opening from vehicles already parked. What wasn’t stated though is it’s important for cyclists to be able to take a primary position where the road narrows or there isn’t space to do this. To do this you must cross the tram line at a narrow angle, and this can be very dangerous. Tram stops are a nasty periodic danger, they are built out into the road so there is no gap when people board a tram. This buildout narrows the available space to the left of the track to about 35cm. On a bike you need to either move out into the middle of the tracks or risk crashing into them by going up the inside, like the guy in this photo does. This is an often quoted problem that cyclists face on the tram network, that at regular intervals along a route they are forced to move out in front of other traffic whilst negotiating crossing the tram tracks. Trams cannot pass people on bicycles, there is not enough room as the trams and tracks are designed to sweep within 38cm of the kerbline, known at gutter running. 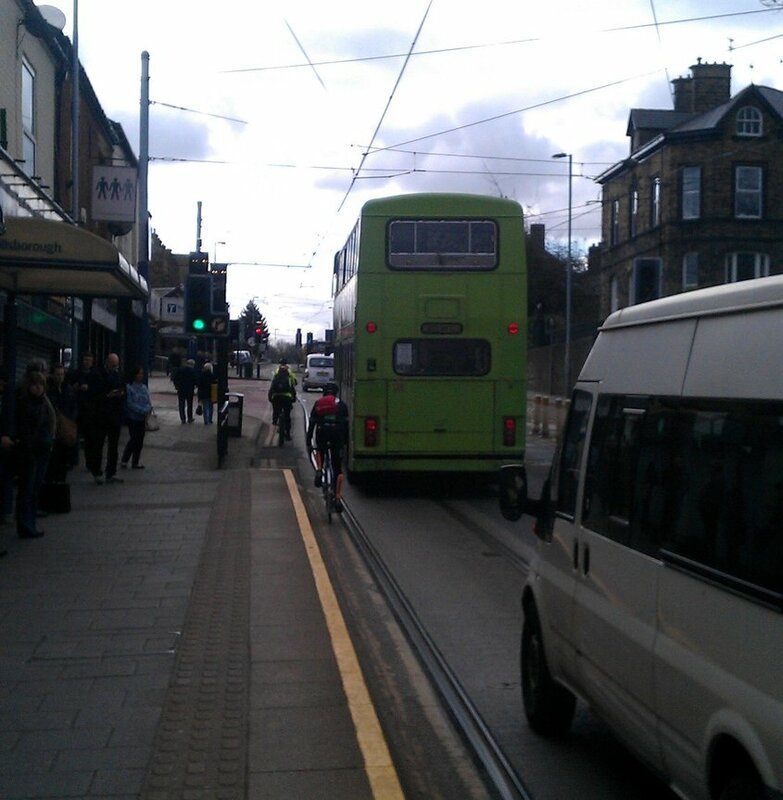 The tram is unable to move out and the cyclist is unable to move in. Advice from Stagecoach who run the trams to cyclists is “get off the road”. Supertram publicity leaflets suggest in their advice to cyclists, “when a tram is approaching move clear of the tramway”, and Supertram spokesmen have publicly supported this opinion. This has lead to problems with bullying when trams come up behind cyclists. Some cyclists however, have experienced problems when they have found themselves ahead of a tram. Reports suggest that some cyclists have been bullied by Supertram drivers who have expected the cyclist to pull over, stop and allow the tram to pass. 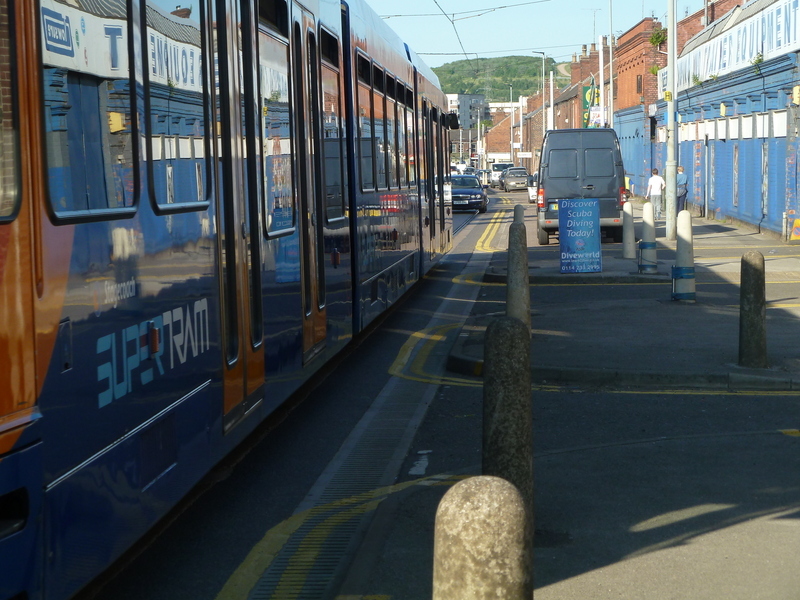 Supertram drivers have been accused of intimidating cyclists in this manner by sounding the warning bell, driving very close behind and attempting to pass without sufficient room. These actions have forced”cyclists to stop for fear of serious injury. The report makes it clear that trams have no priority over bicycles as we would expect. 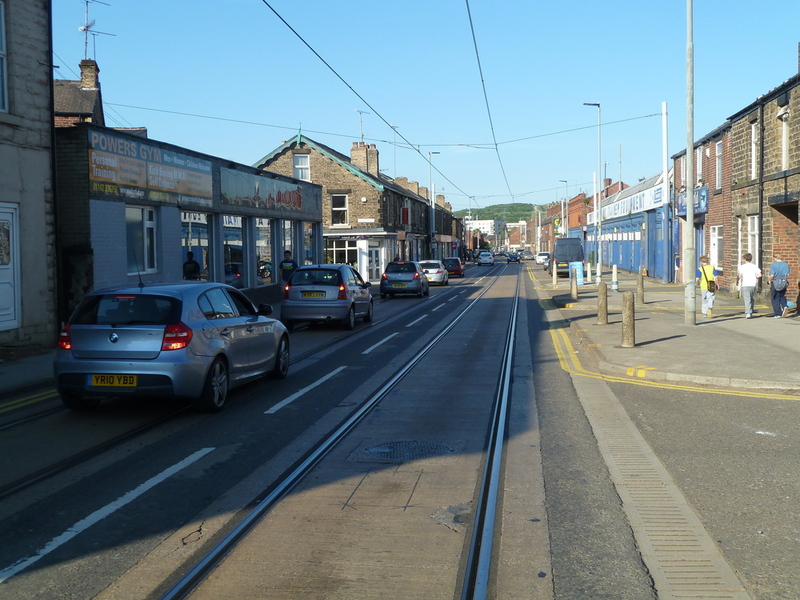 It should be reiterated that the tram has no right to this supposed priority and that, assuming no vehicles are prohibited by Traffic Regulation Order, all vehicles have an equal right to use the carriageway. The tram lines have been in place for almost 20 years and no good solutions have been found. There is a cycle track along about 150m of tramway, but this is the only example. There are plans afoot to extend then tram network further into the City Centre along designated bicycle routes. There are also plans to replace the rails which those of a different design – this impact on cyclists is not clear. So, when in Sheffield on a bike and you come across a tram line, find an alternative route. Cyclists need access to high amenity areas in a similar way that pedestrians do. The Supertram route often passes along the main road through these areas and thus alternative, useful routes are difficult to locate. Encouraging cyclists to use alternative routes is likely to take them away from the areas they wish to access and may therefore be of limited safety benefit. The report I’ve been quoting from is available here. This entry was posted in tram, Uncategorized on June 8, 2013 by Matt. Travelling around as I do, I’ve been to lots of cities where tramlines and cyclists co-exist safely – Amsterdam, Seville & Bratislava where I am at the moment. What’s the secret I hear you ask? I’ll tell you- no other traffic! Put a tramline down the middle of a pedestrianised shopping street & cyclists can use it safely. Add motor traffic into the mix and the problems start. Sheffield in its wisdom allows cycles, motor traffic and the tramway to mix and the one place where cycles and trams could mix safely, the High Street, cycles are banned. Clever huh? I want to start collating new information on recent accidents and injuries to cyclists on the tram tracks in Sheffield arising from finding 3 colleagues in my workplace who have all come off. I’ll start tweeting and may begin a blog page where people can comment as an easy way to collate. I thought I’d get in touch with you first though, in case you have any further thoughts comments? I’ve come off at Manor Top. Now, unless by a miracle I’m the last to go through the lights (unlikely because even if I pass the line at amber there’ll be several RLJing cars behind) I have to pull to the left, wait for a gap, cross the tracks and carry on. Crossing them as they cut across the main road lanes at a stupidly narrow angle is suicidal. Wow, that seems like a bad response, who did you write to? A couple of people spoke to me at the Peace In The Park event this weekend and said that they’d had recent accidents. Feel free to post the reply in in the comments here, I’d like to read it. I also came off near Manor top this weekend, front tyre went into the tram track (couldn’t get a sharp enough angle to cross without pulling out into traffic) and I was thrown off hard. Torn all the ligaments in one arm, cracked my helmet (thank god I was wearing it!) and scraped a lot of skin off my leg and shoulder. Arm is strapped up, and is pretty much completely useless and very painful. Guess there is nothing to be done about tram tracks but we really need more cycle paths to take cyclists away from them all together. That sounds really nasty. I don’t know this part of Sheffield but it sounds like quite a few cycle/tram track incidents happen at Manor Top. I’ll have to go and visit. Had an accident last week in West St. My front wheel went Into the tram track and I came off my bike. luckily not too badly hurt. The problem with West st is you have to cross the tracks at some stage as the tracks get very close to the kerb at the tram stop. Yes, agreed with West Street. Do you come down Glossop Road and onto West Street? I hate the way you have to cross the tram tracks as such a narrow angle. I’m really interested to find out if you reported this anywhere? Did you look for somewhere to report it and couldn’t find somewhere? How did you find this post? I’m wondering if there is value in setting up something to record these crashes and if it would be used. So how do they manage in the rest of the world? In Amsterdam there are trams tracks everywhere and far more bikes. This is all very interesting. And this is a rather long reply, some months after the original post! I used to cycle a lot, including commuting in London. In mid September 2014 I made my first bike trip for years, and first one in Sheffield. I came off in Middlewood Rd., Hillsborough. Stupidly was not wearing a helmet, so spent a week under observation in hospital with head injury. I also broke my collarbone. Because of bang to head can’t remember what happened, but was thinking I had got wheel stuck in tramline. My GP is fed up with the number of accidents he comes across (he had one himself as well) and thinks people are losing traction when accelerating across tramline at the wrong angle. He thinks there ought to be a website as Jeremy Clines mentioned in January (post above). I was thinking of doing something, but if others are thinking of it, I am happy to let them but would like to help publicise it. I have been looking at the information available from the council and universities about staying safe and am trying to talk to Supertram about promoting safety and whether there are changes they can make to the lines themselves. Their safety leaflet does mention crossing the tracks at 90 degrees but I wonder if they could publicise this more. I also wonder if there’s a place for a website for health professionals to report what they see, instead or or as well as a site for people to self report. I’m part of CycleSheffield and we’re working through putting something together to record these incidents, we’ve got a spreadsheet at the moment, but nothing more. You’ve got plenty of good idea’s, we’ve looked at rubber track inserts before but I think came to the conclusion that it wouldn’t work. Are you in Sheffield? Would you be interested in getting involved and helping to put something together? Can you collate Sheffield details and let me know a bit more – I’m looking at the whole UK picture. I also work with STRAIL who have been producing a viable level crossing system which has a flangeway filler since 2006. In 2011 2 sections were retrofitted to the on-street metre gauge (UK = 1.435m) trams in Geneva. http://www.strail.de/uploads/media/PB_veloSTRAIL_Test_installation_Geneva_gb_UK_low.pdf The system has Network Rail approval for use on conventional vignoles section rail, and has been installed in a similar manner to street tram track at Aiskew near Northallerton since November 2013 – it is now also in Hull on Walton Street. 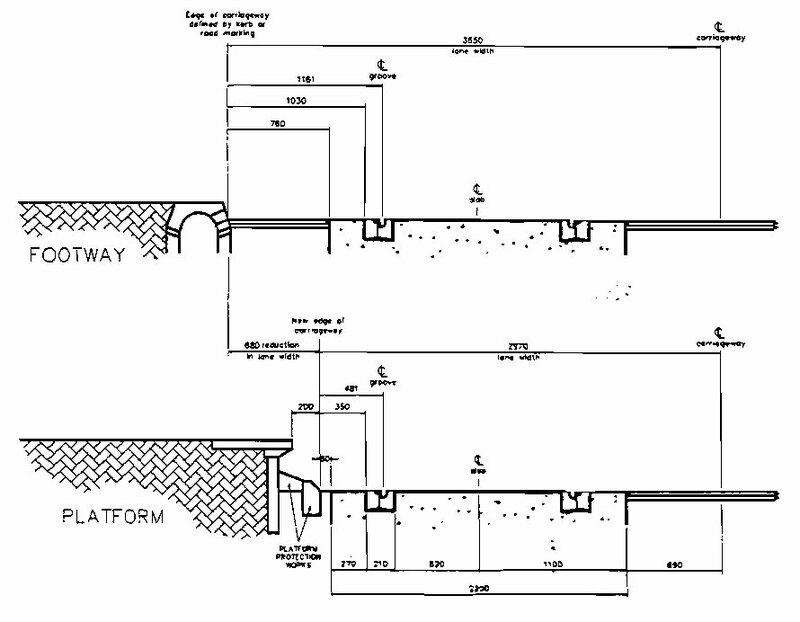 To fit UK tram tracks will be a tougher job, as the UK designers have been a bit too enthusiastic with the use of high strength reinforced concrete, which would need to come out. Those with some history of living in Sheffeild might also remember Roe vs Sheffield Supertram & Others, where an unfortunate driver found his car tyres lifted clear of the road, leading to a serious crash. As a result (I was told) Sheffield has been espedcially diligent on making sure the rails are not more than 3mm above the abutting road surfaces, but clearly from the photographs posted this detail is not being adhered to during the work on the tracks, and there seems to be no signage or other mitigation of the hazards the work has presented, if that track is on roads you are using with bicycles. There are perhaps 3 or 4 ways that rails bring down cyclists. The high rail head will have the tyre sliding sideways at any angle of crossing if there is a side force on the contact patch, it also provides one of the ridge steps noted below, and when the tyre is bridging the flangeway slot at a shallow angle the reaction forces act at diametrically opposed corners of the contact patch to apply a turning moment which at a low speed will overwhelm the momentum and forward velocity to turn the wheel parallel to the groove. A further possibility is actually riding directly in to the groove, but you’d been pretty unlucky or stupid to do that just riding along. Of course the old trams actually used the bettter option – of going down the middle of the road and in doing this eliminated the hazardous sections of high ‘kerb/platform at the road edge to walk off or collide with. a central set of tracks means that where no road is needed, the track can be in a grassed median, reducing noise, attenuating rainfall run-off, purifying the air, and moderating the extremes of climate, and leaves a more generous space against the kerb for a wider cycling ‘lane’ and less of a shallow crossing angle when the tram tracks go around the corner at a junction. Just look at tram routes being built in other places and you’ll see most go in the middle and use the faster to build and lower cost options that this offers. Still we have what we have, at least until the next major replacement of rails in 25-30 years’ time. Had I realised they were so slippery I would have got off and crossed, but lesson learnt I suppose. Once I stood up, check the bike all a bit dazed I had some idiot beeping his horn at me from behind to hurry up and shift out of the way… very considerate indeed! A queue of cars on the other side of the road… not one person got out and asked if I was ok.
Not sure if anything is out there to record these incidents yet, but I would be happy to help out if I can, I’m a web dev by trade so could do something online to record these incidents? Anyone interested? Nothing’s been done on this yet, I was thinking about keeping it simple, just a quick Google Web Form at a URL somewhere. Capture the detail into a plain old spreadsheet on Google Drive and that’s about it. It’d need some kind of policy about how the data is shared/make available, but that’d be about all that was needed I think. Yes, I’m not a user of Google docs myself to be honest (no particular reason), but that sounds like a good plan. Saves you the hassle of hosting and building something up from scratch. I guess most of the crashes go unheard of by the authorities, so it would be good to have record of it – are you planning to send this list to someone at the Council perhaps? Why do you think rubber inserts wouldn’t work? There’s at least one commercial product (veloSTRAIL) and similar things seem to have been used in other European cities for many years now.